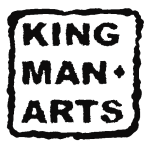 David Kingman has been involved with the art and craft world all his life. In his teens he was at his father side as he learned and mastered the art of stained glass. David helped his father with large format stained glass church windows by doing calligraphy of bible verses on the glass and also helped with various lamp projects. David did some of his own window projects that were exhibited in Westport galleries in the Kansas City area. David went on to graduate from the Kansas City Art Institute with a major in Design. In the intervening years David got technical training and worked as a Programmer/Analyst while supporting his family, but continued his interest in art and continued to do watercolor paintings. In 2001 David left the IT world to start up a coffee farm with his wife Joanne on the Big Island of Hawaii. The property they found was in South Kona at 2000 feet in elevation and was just up Mona Loa Volcano (mauka) from Millolii, the oldest continuously inhabited Hawaiian fishing village and the local boot maker. He roasted and sold his coffee on the Internet, designing all the graphics for the konamist.com website and ads in Hawaii Magazine. Creating the Kona Coffee farm, while it incorporated technical aspects of horticulture, irrigation and construction, was as a creative process as painting a picture, if not more so. During this period he began fusing art glass and continued his first love, watercolor painting. Inspired by the nature and culture of Hawaii, David remodeled his kitchen and replaced all the kitchen cabinet doors with custom made cabinets with fused glass inserts with a tropical theme. He is still available to make custom kitchen or bathroom cabinets doors. David sold his fused glass pendants at open air markets and tourist stops in Captain Cook, Hawaii. David returned to the Northwest calling Eugene, Oregon home and continues to create artwork. David has always been interested and worked in various media including Jewelry, Wood Sculpture, Stained and Fused Art Glass, Photography as well as Watercolor and Oil Painting. More recently David has been creating Flame Worked, or Lampworked, glass art using a torch. This incorporates many of the same techniques as traditional Glassblowing and is often referred to as Glassblowing in recent years, as Lampwork is a somewhat archaic and misleading term. David has volunteered at the Eugene Glass School and served as webmaster for the Oregon Glass Guild. As a member of the Oregon Glass Guild he exhibited at the “Gathering of Guilds” show at the Portland Convention Center. He also has volunteered at the Habitat for Humanity “Restore” in Eugene, Oregon and has been a CASA (Court Appointed Special Advocate) for a child in foster care in Lane County.